The encrusting bryozoan, Membranipora membranacea; Gymnolaemata > Cheilostomida > Membraniporidae. The encrusting habit is characteristic of many bryozoa, although some have erect colonies that resemble miniature corals. Bryozoa are commonly encountered even in intertidal rockpools, or found cemented on other organisms such as kelp or seashells. 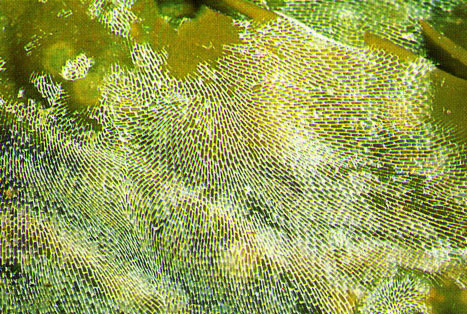 Bryozoans, or "moss animals," are aquatic, mostly marine, colonial organisms, superficially rather like coral. A few to many millions of these individuals may form one colony. The colonies range from millimeters to meters in size, but the individuals that make up the colonies are tiny; usually less than a millimeter long. Usually they encrust rocky surfaces, shells, or algae. The colonies may be soft-bodied or calcareous like corals. It is the latter that are most often fossilized. There are about 5000 living species, with several times that number of fossil forms known. After approximately 250 years of scientific study, the sum total of accumulated human wisdom on the subject of bryozoan phylogeny is Nil. Zero. Nada. It would be fair to state that we know as much about the phylogeny of entirely hypothetical Martian cryptobionts. Those, at least, have been the subject of intense speculation by learnèd folks who can get away with such speculations in the semi-popular press. Bryozoologists just throw their hands up -- like so many zoöids waving their happy lophophores about. Maybe they'll catch onto something that way -- but we are not optimistic. Scanning electron micrograph of part of a bryozoan colony showing male and female brooding zooids and feeding autozooids.. These are marine bryozoans with tubular zooids with strongly calcified walls. The lophophore is protruded by action of annular muscles. Most forms lack an operculum. This was the predominant Bryozoan group during the Paleozoic. Some grew as lacy or fan-like colonies that became important reef builders and in some regions form an abundant component of limestones. Their numbers were greatly reduced by the terminal Permian extinction event. 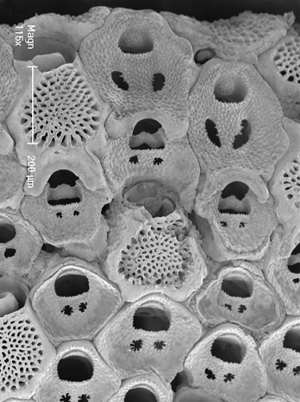 A group of bryozoans similar to cyclostomatids; of uncertain relationships. Late Ordovician to Carboniferous. Includes some of the most amazing bryozoa. The colonies are erect, typically delicate; reticulate (net-like) or pinnate (fern-like). This order was previously included under the Cryptostomata. Mostly marine bryozoans with cylindrical or flattened zooids. Lophophore is protruded by action of muscles pulling on frontal wall. Includes the majority of living bryozoan species..
Non-calcareous freshwater bryozoans with no zooid polymorphism. Horse-shoe shaped lophophore.. No fossil record except for a few statoblasts (resistant wintering structures) from Quaternary sediments. illustrations from the former The "Lesser" Protostome and Lophophorate Phyla page at University of Sydney Biological Sciences, from Brusca and Brusca, Invertebrates.1990. University of California Museum of Paleontology -- Introduction to the Bryozoa - "Moss animals"